When your child has fever it can be a very frightening experience forthe parents. However, fever alone is not dangerous and is a sign yourimmune system is fighting off an infection. How your child appears is a more important indicator than the fever, itself. 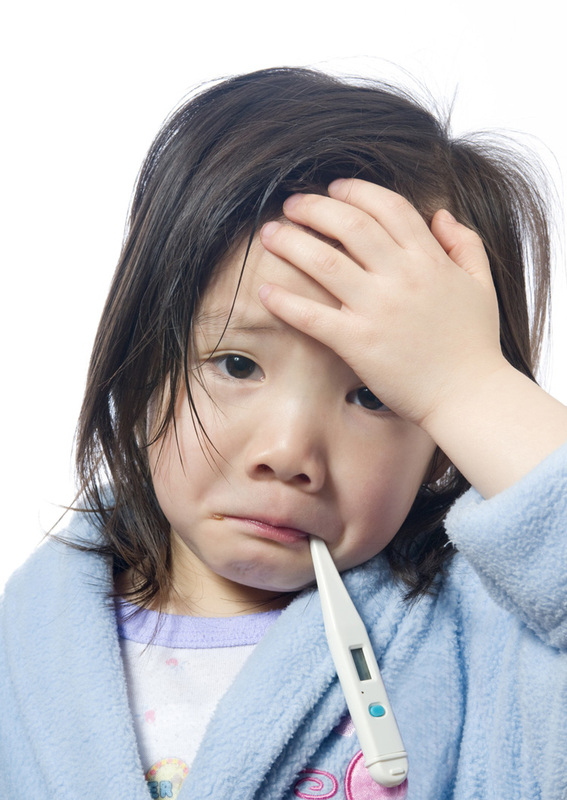 A fever means thebody temperature is greater than 100.4°F (38.0°C) (rectaltemperature). The most common cause of a fever is an infection.Infections of the upper respiratory tract, such as colds and flu, are very common, especially in preschool children. Young preschoolers canhave five to ten infections each year. These infections are caused bya virus and get better on their own without antibiotics. Bacteria maycause some infection. If your child has a bacterial infection, he or she will get better much quicker if antibiotics are prescribed by a doctor. So how can I take care of my child when he/she has a fever? First, encourage your child to drink extra fluids, because when you have a fever you also tend to be dehydrated. Do not over bundle your child; it will cause a higher fever. During the time your child feels cold or is shivering (the chills), give him a light blanket. You can also give medicines to reduce fever, but remember that fever is helping your child fight the infection. Use medicine only if baby has fever and looks uncomfortable. For low fever you can give Acetaminophen (Tylenol), based on your child's weight every 4 to 6 hours. For higher fever you should use Ibuprofen (Advil/Motrin) which tends to bring higher fevers down more effectively, (6 to 8 hours instead of 4 to 6 hours). One should never give Aspirin for infant/children with fever. If the fever persists one can use a sponge bath with lukewarm water. So when should I call my child's health care provider or to go the ER? Go to the ER if your child is less than 2 months old as this is consider an emergency. You should also go to ER if the fever is over 105°F (40.6°C) or your child looks or acts very sick or have any concerning symptoms such as fast breathing, appears extremely sleepy,and ect. You should contact your primary care doctor, if the fever is higher than 102°F 0°C, your child has had a fever more than 24 hours without an obvious cause or location of infection, or your child is less than 2 years old, your child has had a fever for more than 3 days, or you have any concerns or questions.